But it’s deeper than that, of course. Beyond benchmarking against other B2B companies, there are critical questions you need to resolve in order for your marketing program to achieve something strategic, rather than merely consist of a variety of disconnected tactics. - What’s working in branding and lead generation for you today? 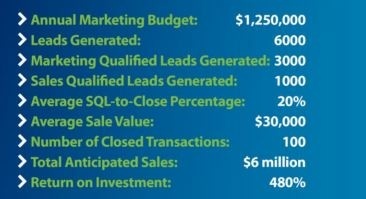 - What’s your cost/quote, cost/sample request or cost/SQL (Sales Qualified Lead)? And how can we reduce that? - How long does it take to move a prospect through your sales funnel, and how can we accelerate that? It’s beyond just pushing out more emails or white papers. When building your budget for 2018, it’s time to get more sophisticated, more strategic and more focused on the metrics that matter – revenue, opportunities and quote generation, not just lead generation. It’s different for every marketer, of course, and the formulas may be different in your company. For instance, your close rate on SQLs to sales might be higher or lower, or your average sale value might be lower. All that affects the lead flow your pipeline needs, and determines the level of marketing spend. Making that connection to the CEO’s growth goal and marketing spend is critical, but few companies truly make that linkage. Here’s an example: the CEO sets a 25% growth goal, which might require 100 new $100,000 customers. If your close rate is 10:1, then you need 1000 qualified leads to enter the funnel this year to hit that number. And if your cost for generating that lead is $500, then your marketing budget will need to be $500,000. Understanding what each of those ratio and cost numbers are for your business will ensure that your CEO and marketing budgets are aligned. We’ve provided a variety of other recommendations on building your budget, based on a variety of research from leading b-to-b analysts and technology companies. Get your copy here, and make 2018 the year you build a budget for IMPACT!